Obviously, you may have already watched/read the truncated version that I did as part of The Weekly Pop series but I would encourage you to take a watch (if not all, then at least a few minutes) to see what is like to deliver it in front of a live audience. 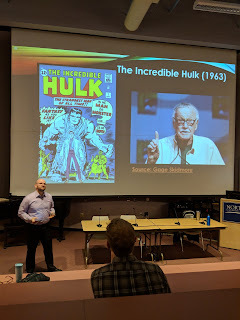 I mean my jokes weren't as funny as when I gave my go at doing stand-up (though those weren't that great either), but at times, I feel as if I hit a good rhythm and dynamic in the lecture. You can watch the video below or check it out on YouTube. Either way, be sure to swing back here and let me know what you think.